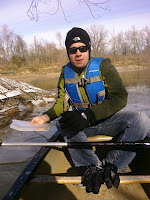 Taking the Minny III on its maiden voyage. This boat is incredibly fast, very stable and super comfortable. 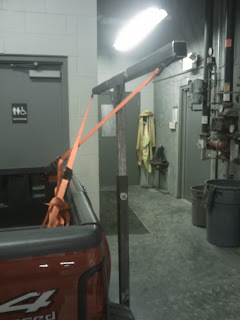 Our hitch mounted rack was "completed" tonight as Jeff, Dad and myself (the 3rd dude is vacationing in Key West . . . jerk) put the final welds down to full assemble what will carry our winning vessel. All 3 Dudes in the shop welding up our boat support for our MN III's arrival next week. 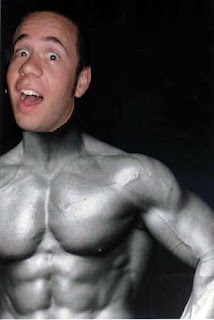 I joined the gym two doors down from my apartment in Columbia, MO so that I can weight train for the MR340. Over the past two years I've learned quite a bit about weight training in general and how big of a role it plays in general fitness. An AMAZING book to really get your body into great shape is Tom Venuto's Burn the Fat, Feed the Muscle. It's smartly written and makes a lot of sense. It doesn't rely on any crazy diet but it does require a significant change in your daily eating and exercise habits. Unfortunately I've been off my game for about 5 months now and have a lot of catching up to do. I plan to do my typical chest, shoulders, arms, legs and core routine but now I plan to get pretty specific when it comes to muscle endurance. That will require me to do a lot of high rep, low weight activities. I found a really great site that will help me develop a paddling specific weight routine and when I get it down, I'll post it here. 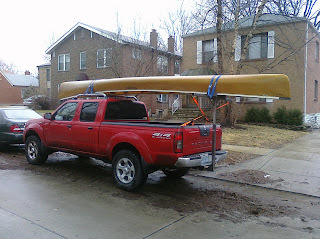 I'm pretty sure we'll be on the river this weekend, we'll post some pictures and updates while we do so. Hopefully the recent snows here won't cause any problems! The idea of the three Moore brothers attempting an epic adventure dedicated to the memory of our beautiful mother was cast soon after our mom passed away of colon cancer in 2007. Various ideas were discussed and eventually tabled as nothing really presented itself as feasible. Over Thanksgiving 2009, however, we were in Indiana visiting relatives when the subject surfaced again and the MR 340 was mentioned as the possible format. The MR 340 is a 340 mile river race down the Missouri River from July 27 thru July 30 in which competitors are allowed 88 hours to complete the distance. Immediately we got to work researching the event and reviewing the possibility of joining with a colorectal cancer foundation to raise money and awareness for this terrible disease. 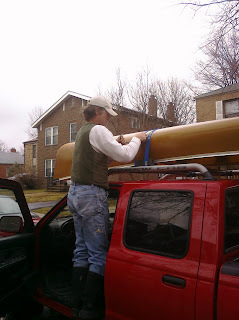 The team “3 Dudes In A Canoe” was born on January 4, 2010 and we were underway obtaining a boat and establishing a training program to get us through the 340 miles. Our mother passed away from colon cancer in June of 2007 at the very young age of 54. She had successfully battled cancer after her first diagnosis in 2005 with surgery and chemotherapy but an aggressive version returned a year and a half later that she could not overcome. Kathy was raised in St. Louis and attended Cor Jesu Academy where she graduated in 1970. After receiving her Bachelor of Science in Elementary Education at Missouri State in 1974, she married her college sweetheart, David Moore, and began her teaching career at Annunziata in Ladue until the school closed. Soon after, she taught at St. Lukes for two years before taking 15 years off to raise her boys. When the youngest son, David, entered 4th grade, Kathy returned, full-time, to St. Gerard Majella and then on to Sappington School in the Lindbergh School District in 1996 as a 5th grade teacher. During this time she earned a Master of Science in Education through Maryville University. Kathy was a fantastic mom who prepared breakfast every morning and dinner every night for her family, made our beds, grocery shopped every week, helped with homework,” liked” all of the girlfriends we brought home, slipped us money on the way out the door during college, took us on vacations, loved her dachshunds, loved her granddaughter, loved her husband of 32 years, and loved teaching kids. She volunteered for numerous school events while wearing her teacher themed sweaters and somehow managed to be a wife during that time as well. She was missed from the moment she passed away and will continue to be missed for as long as we are alive. Subscribe to "3 Dudes In A Canoe"